Recently, my most expensive lens in my setup was giving me some problems. Something seems loose and it affects the focusing. These are the symptoms for the lens. The lens refuses to focus to infinity at 70mm, it shows no such problem at 210mm. Occasionally, the lens refuses to focus and you could hear the 'gears' rubbing against each other. The lens seem fragile and seem like it would fall apart any time. 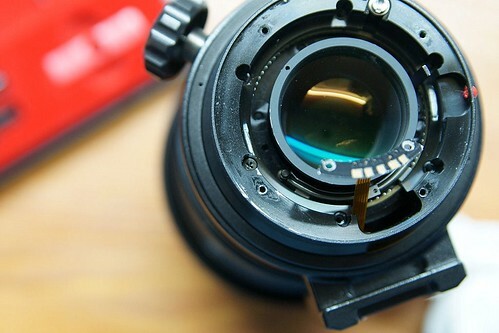 The root of the problem was clear, something is loose inside the lens affecting the autofocus. Since I got this out of production lens cheap, there wasn't any warranty in it even though it is less than 1 year old for me (but the lens could be more than a decade old). Anyway, I had some free time after my examinations to do some exploration and managed to fix it. Here's how I did it. Unscrew the lens mount (held with 4 screws) but be careful as the screws are 'glued' so if you are not careful you might ruin the thread and lose a screw when you have to use emergency measures to remove them (like me). Unscrew the lens mount contact (2 screws) too and get prepared to remove the metal lens mount. 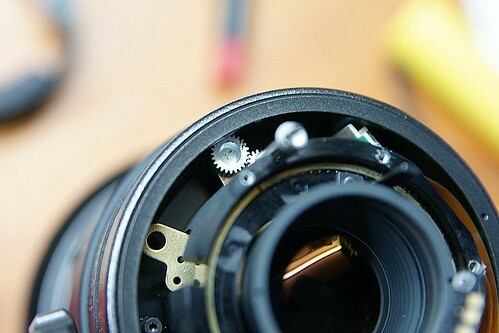 After removing the metal lens mount, you will find many more screws here. unscrew those 6 screws held 60 degrees apart. You can see that I removed 5 out of 6 of them here. 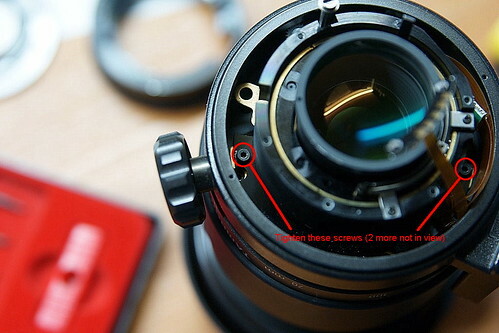 Now when you are done, remove this part of the lens mount too but be careful as the screw drive focus mechanism is housed here and if you lose that screw, you lose autofocus. 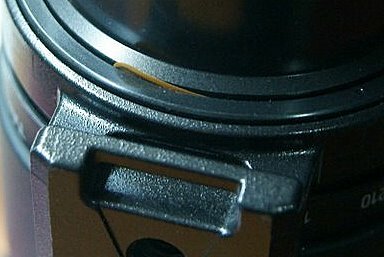 A closer look at the screw that drives the auto focus for Minolta lens. At this stage, the spring that controls your aperture is exposed too. If you have problems with the aperture, I guess you could start to work on it here. 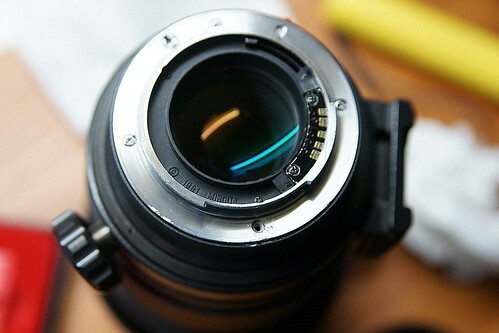 Mess up your aperture spring and you will get a true 'constant' aperture lens. Now once you removed that part, you will find 4 screws, of which the 2 visible are circled here. Now these screws are hex (allen) style instead of the phillips head type. You could look for a hex key to tighten it or you could just use your screwdriver like I did. After tightening, put back all the parts and screw tight. 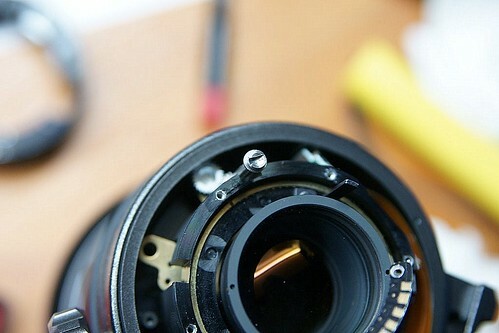 You may want to use your blower to blow away any dust in the process and use tissue to clean the lens mount area. Finally lens cloth for the finishing touch and your lens is ready. Unless you are like me. Carelessly left some parts outside the lens so I have to take it open again just to stuff it back in. Now my chair is a bit wobbly recently. Maybe I should get a spanner next. hey dude.. are u keeping ur lens in a dry box.. after exposure to air.. hope ur lens doesnt get mouldy or collect dust..
not to worry bcos the lens group were not opened and affected in any way. Besides, if you study the last pic, this lens is not 'sealed' at all so dust can go in nonetheless. This is a Flickr badge showing public photos from picturemastermind. Make your own badge here.